There is a simple, financial answer to the question posed in the headline of this article: Lionel Messi is reportedly worth €450,000 per contractually-arranged international friendly. 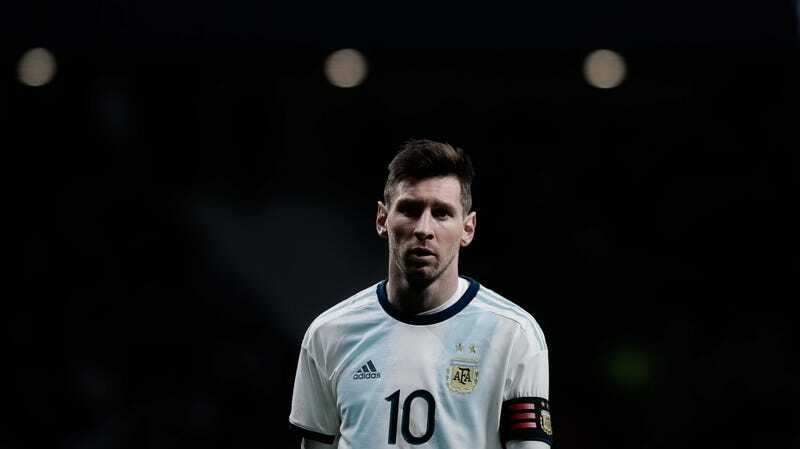 That is how much the Argentinian Football Federation (AFA) lost out on after Messi’s recent groin injury kept him out of the Albiceleste’s friendly against Morocco in Tangier on Tuesday. More metaphorically, though, what does a 31-year-old Messi bring to Argentina, and can anyone at the helm of either the team or the AFA figure it out in time to win a trophy with the best player of all time? It’s posed as the great mystery of this era, that Lionel Messi, who has won everything under the sun with Barcelona, can’t seem to win anything with Argentina. Of course, the narrative of Messi’s lack of international success is a false one—no fair observer could describe an Olympic gold medal, three consecutive and four total major tournament finals, a Golden Ball award in his run to the 2014 World Cup final as the tournament’s best player, and the record for most goals ever scored for one of the most storied national teams in the sport, as a failure—but a little thing like truth has rarely prevented narratives from becoming fact in the minds of the public. Context is irrelevant here. One concerned with context could point out the evidence to refute the case against Messi’s international career, like the aforementioned success, or that the AFA wasted the 2010 World Cup by appointing Diego Maradona as manager, or that Argentina lacked a fully healthy Sergio Agüero and Ángel Di María for the 2014 World Cup final, or that Gonzalo Higuaín had chances to win all three finals but failed to because of his uncanny anti-clutchness. But none of that matters to the all-flattening Discourse. What matters, at least most recently, is that Venezuela beat Argentina 3-1 on Saturday while Messi played, and that Argentina beat Morocco 1-0 on Tuesday while he was resting an injured groin. While neither of Argentina’s most recent opponents are push-overs—Morocco qualified for and looked pretty good during the 2018 World Cup, and Venezuela have somehow continued their upward trajectory despite the turmoil in our country (full disclosure: I’m Venezuelan)—a country of Argentina’s stature should wipe the floor with both those teams, particularly in the final tune-up games before the 2019 Copa America, perhaps one of Messi’s last real chances to win an international tournament. Even more worrying than those results, however, is how Argentina looked in both games. Venezuela’s second goal was of the unstoppable wonderstrike variety, but the South American minnows could have scored as many as five other times simply by running past Argentina’s back-line over and over. On the other side of the ball, Venezuela adopted the one method proven to be successful at slowing down a Messi team: continually throw bodies at the star man, and make someone else beat you. Unsurprisingly, no one else beat them, and so Venezuela came out victorious. The flagging performances continued on Tuesday in Messi’s absence. Juventus star Paulo Dybala enjoyed a brief reprieve from his exile on the bench as Messi’s replacement, notching only his 10th start for his country, but Argentina didn’t look any more fluid. Morocco controlled the ball throughout, finishing with 57 percent possession. The North African side did run into the same problems they found at the World Cup (mainly, their inability to convert all that flowing possession into goals), but they were the better team, no matter the scoreline. In fact, the scoreline, and the tricky individual work by Atlético Madrid supersub Ángel Correa that gave the Argentines the game’s only goal, were the only good things Argentina could take away from the match. It should not be so hard for Argentina to score goals, with or without Messi on the pitch. Dybala (when he’s allowed to play), Correa, Lautaro Martínez, Cristian Pavón, and of course Agüero and Di María, all have goals in them, and some combination of that pool plus Messi is the foundation for as fearsome an attack on paper as any in the world. But it’s everything not included on that paper lineup that makes Argentina playing well such an impossible notion. Without Messi, Argentina would be seen as a flawed bunch of mostly young, promising, but limited players who wouldn’t be expected to win much of anything. But with Messi, and the towering expectations that accompany his mere presence, Argentina are immediately cast in the minds of their fellow Argentines as the prohibitive favorites from whom victory is demanded, failure is expected, and punishment will be exacted unsparingly. Each successive near-miss over the past five years or so only served to ratchet up the pressure the country’s famously toxic soccer culture subjects its national team to higher and higher. And that pressure to win will continue to suffocate Argentina until Messi either finally retires from internationals or finally wins something. So many of those moments came from Messi going it alone. And yet, for as consistently great as Messi has been for Argentina, his solo performances have never been enough to deliver his country, his teammates, and himself from all this unbearable pressure by winning a trophy. With just over two months until the Copa America, nothing the team has done since being knocked out of the last World Cup has quelled the doubts around Messi’s Argentina. It’s an agonizing catch-22: Argentina cannot win without Messi, and yet everything that comes with Messi makes winning alongside him so incredibly difficult. By returning to the national team after a long time away, Messi and Argentina have made it pretty clear that they intend to try again to win the Copa this summer in Brazil. Thus the stage is all set for Messi to find himself right where he has been for most of the past decade with Argentina: with the team and the country placed squarely on his back, everyone hoping against hope that his still-very-human body can push them, finally, over the finish line.